Alaska Natives say a photo ID rule would be a roadblock to voting in the Bush. A decline in turnout there, with its traditionally heavy Democratic vote, could affect the 2014 reelection hopes of U.S. Sen. Mark Begich, a Democrat running in a Republican-leaning state. One of his potential rivals is Alaska’s top election official, Republican Lt. Gov. Mead Treadwell. Treadwell says he doesn’t support the voter ID bill, but Kobach says Treadwell was instrumental in getting him involved in promoting the Alaska legislation. In an April statement to reporters that didn’t mention Kobach or Kansas, Treadwell touted the cross-checking as having found 14 people suspected of “actually voting in both Alaska and another state” in 2012. Treadwell threatened to prosecute the voters if the allegations were confirmed. Alaska elections director Gail Fenumiai recently said 12 of the 14 voters cited in Treadwell’s April statement were wrongly identified as duplicate voters and actually voted only in Alaska. 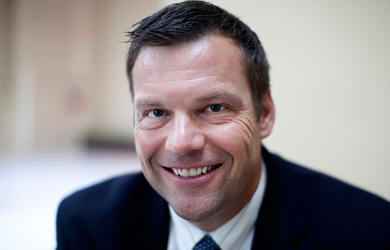 Kobach told the Daily News it was he who suggested to Treadwell that Alaska get involved in the Kansas project. “I personally talked to Mead Treadwell, your lieutenant governor, and encouraged him to join, and he did so,” Kobach said. And his testimony on the photo ID bill, Kobach said, was the result of a conversation with Treadwell. Treadwell, who said he doesn’t support the Alaska bill because of the difficulty for Bush residents to get photo identification, said he didn’t recall talking to Kobach about it. Photo ID measures are controversial across the country. Advocates say they help prevent fraud. Opponents say they make it more difficult for particular groups of people to vote: the elderly, students and the poor who don’t own cars. In Alaska, the situation is compounded by the difficulty of getting to a Division of Motor Vehicles office in a regional hub like Nome or Bethel from a small village. Alaska doesn’t even require a photograph on a driver’s license in dozens of Bush communities. Democratic activists say photo ID bills have the effect of disenfranchising more Democratic voters than Republicans. In his annual address to the Alaska Legislature this year, Begich criticized the bill as making it more difficult for Alaska Natives and Hispanics — two traditional Democratic groups — to vote. The sponsor of Alaska’s bill, who has acknowledged that he drafted the measure using materials from the corporate-funded conservative group ALEC, had odd words of consolation for those concerned about the suppressive impact of the bill: at least it wouldn’t be as bad as Iraq! Rep. Bob Lynn, an Anchorage Republican who is prime sponsor of the voter ID bill, said he wasn’t trying to disenfranchise anyone. He dismissed opponents as complainers who should be happy they don’t face the kind of obstacles voters do in places like Iraq. “Terrorists have threatened to kill anyone who voted, but they voted anyway, and then these voters put ink in their finger to prove they had voted — evidence that could have gotten them killed. Now that’s a hassle, to say the least. Needing a photo ID to vote in Alaska wouldn’t even come close to that,” Lynn said when his State Affairs Committee first heard the bill in February.